These four classifications of seasons are wisely related to land-locked areas or the areas far away from sea coast which mainly comprises of Northern and Central regions of India. The peninsula India hardly gets any variation in the seasons and the climate temperature remains the constant throughout the year. 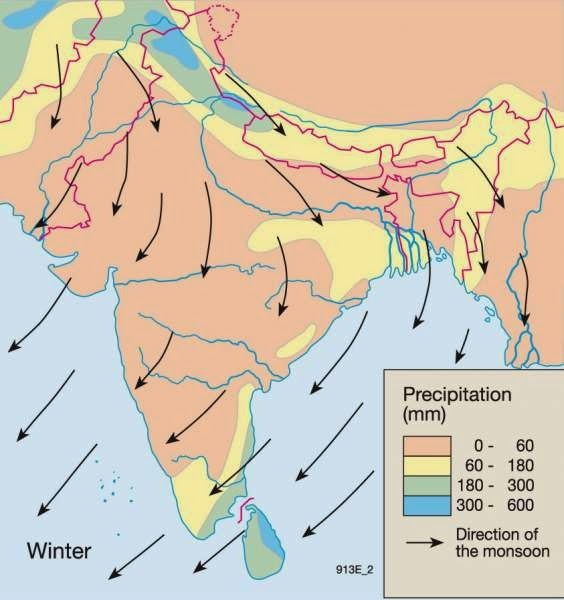 But, the season which brings the heavy rainfall during this season in South-east coastal regions of India is the fourth one- the retreating monsoon season which means withdrawal of monsoon from India’s northern plains. Let’s understand the concept of this season. You know that most of the regions of India get rainfall due to South-west monsoon which occurs between June and September, but Tamil Nadu, eastern part of Karnataka don’t get rainfall in this season. After, September the withdrawal of monsoon starts from the northern plains of India and moves towards the south-east regions of India, and by the November and December, the regions get north-east monsoon which gets moisture while passing over the Bay of Bengal and pours torrential rainfall in the Tamil Nadu coasts. Due to global warming and changing pattern of monsoon over the Indian subcontinent, Chennai (coastal area of Tamil Nadu) gets heavy rainfall this time in its 100 years of history. Why did floods occur in Chennai? The floods occur when water in the form of surface run-off exceeds the carrying capacity of the river channels and streams and flows into the neighboring flood plains. This also plays havoc when the capacity of lakes, reservoirs and other inland water bodies exceeds. There can be various regions to Chennai floods which have affected million of lives on the east coast. But, the reasons that everyone has observed that the changing pattern of monsoon and the colonization of flood-plains, negligence of urban development rules and regulations, development on the natural drainage channels and streams of the rainwater played a disastrous role in Chennai floods. The blockage of natural drainage channels with excessive dumping and construction affected more than the changing monsoon pattern in Chennai. It costed the state government over 15,000 crore rupees infrastructure, loss of more than 200 lives, and affected many millions of people. Although, humanitarians, altruists, army came forward, and National Disaster Response Force (NDRF) teams deployed on time by the state and the center government to help and migrate the affected people to the safer places, yet the long-term and properly planned steps ought to be taken to avoid the further confrontation of these types of disaster. National Flood Commission (Rashtriya Bahr Ayog) has already identified 40 million hectares of land in India is flood-prone, which needs to be strictly followed to design and develop the urban colonization. You can say that it is a greed of humans which affecting the natural system of drainage and inland water bodies on the name of urban and industrial development. During floods, it causes more problems to people which are out of safe drinking water, foods, electricity and other basic amenities and most affected regions are lower lying areas which get cut off from the essential supply of commodities. Even after lessen of precipitation and flood water, it takes time to restore as there is urgent need to clear the debris brought by floods and many diseases like malaria, cholera, diarrhea etc may occur widespread. Hence, the people ought to be more aware of during and after effects of these types of disaster.In this consideration only, A PIL was filed by the Kasturba Nagar and Indira Nagar Residents Welfare Forum, seeking the removal of encroachments on the Canal Bank Road along the Buckingham Canal. In their petition, they said the encroachments were not slum dwellings but concrete structures directly affecting the flow of the canal. Comments "Scientific reasons of Heavy rainfall and Floods in Chennai"